A few years ago, I was interpreting the Devonian of northern Alberta in a beautiful 3D seismic reflection survey. Because the target zone was rather shallow, we had acquired a dataset with a very high trace density: a lot of spatial samples. This gave us a lot of detail in timeslices, even if the vertical section views weren't particularly high resolution in these deeper, high velocity sediments of the shallow Givetian carbonate seas. A circular feature caught my eye. Unfortunately I can't show it to you because the data are proprietary, but it was quite conspicuous and impossible to ignore: perfectly round, about 1.5 km across, and with a central mound a couple of hundred metres in diameter. I showed it to a few people and everyone said, 'yeah, impact crater'. Or maybe I just always heard 'impact crater'. I really wanted it to be an impact crater. Bias number 1. 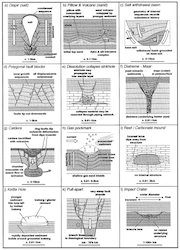 My first action was to re-read one of my favourite papers ever: Simon Stewart's 1999 paper on circular geological features. I love papers like this: basic, practical advice for interpreters. His figure 1 (left) is a lovely graphic. Stewart himself is rather enamoured with impact structures—he was the 'for' advocate in the recent debate over the Silverpit structure in the North Sea. You can read some more about it here and here. The paper gives some equations which compute the probability that, given some assumptions about meteorite flux and so forth, a bolide has cratered right where you are standing at some point in geological history. I built this little Wolfram|Alpha Widget so you can try them yourself (need help?). Of course, this is far from the same thing as there being a crater preserved, or visible in seismic, but it's a start. Bias number 2: Numbers, even dubious ones, look like evidence. I admit it, I got carried away. Bias number 3. But then... we shot another survey. There turned out to be another crater. And then another. My biases weren't enough—new craters finished it. According to those equations, the probability of having one in a 600 km2 survey spanning 200 Ma of preservable time is 0.14, a 14% chance. Pretty good. But the probability of two is 0.012, and three is 0.0007. And these were contemporaneous. And, just as with Silverpit, there was salt. 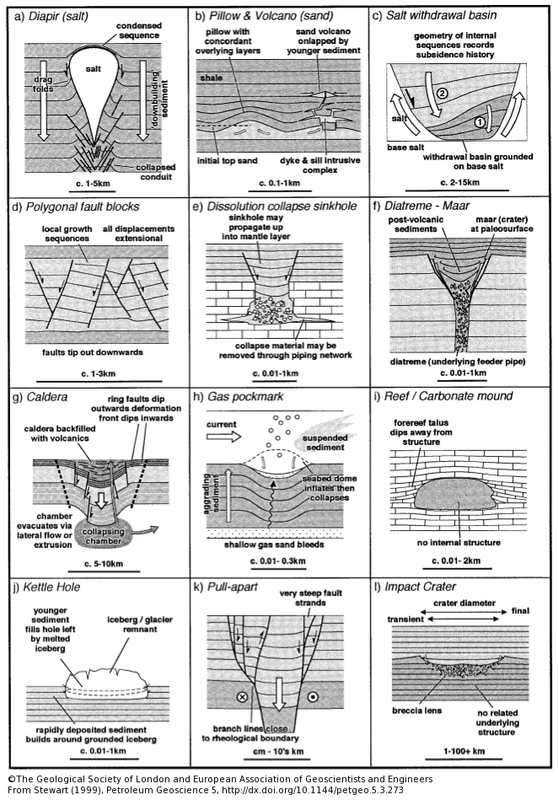 Image from Stewart 1999 is copyright of the Geological Society of London and the European Association of Geoscientists and Engineers, and is used here with permission and with thanks.